Now you have the chance to win not only come yummy hot chocolate but the perfect mugs to go with it! Not only are these mugs absolutely brilliant, they are perfect to hold without burning your fingers thanks to the two finger grips (yes, I know it is a heart but they are also finger grips!). What would your ultimate hot chocolate break be? In a chalet in front of a fire, with friends chatting on the weekend, after work… what would your ultimate hot chocolate break be? This is a luxurious hot chocolate so I’m sure it will inspire some luxurious ideas. Leave your comment here or on this post on our Facebook page and we’ll select one winner of this fab prize. Good luck everyone and here are those ever important rules – I want real people to win and not automated comp entry engines. Thanks to Loquax for providing help to those of us wanting to create fair ways to give stuff away. 1.One entry will be chosen at random from facebook and one entry will be chosen from blog comments that qualify. 2.The competition will run from Wednesday 14th of March 2012 to 1pm GMT Friday 14th March 2012. 3.The selection of winner will be made by the competition organiser using both entry lists and random.org alone and will not be swayed by undue influence. 4.One entry per person to this competition. 6.I also reserve the right to exclude entries that I feel are inappropriate or not in the spirit of the competition. 7.Your details won’t be passed onto anyone else, unless you’re the winner and then I’ll send it to Galaxy so they can send you your prize. 8.I reserve the right to remove entries that I believe aren’t human created or are an attempt to gain an unfair advantage such as automated entries. Feet up on the sofa, fire roaring, children sound asleep upstairs, a big mug of hot chocolate with marshmallows, a couple of biccies (chocolate of course!) and a weepy on the TV. Ah, bliss! My perfect hot chocolate break would be coming home after a long walk on the beach on a winters day and sitting in front of an open fire to enjoy a mug of steaming hot chocolate . My ideal hot chocolate break – after a tough, tough long run (i’m preparing for the London Marathon), when i’ve had a cold bowl of cereal and my body feels slightly chilly. The Hot Chocolate is perfect to quell that chill. My ultimate hot chocolate break would have to be with my daughters, snuggling down under a huge pile of blankets in front of the fire after a long, lazy walk down to the river to feed the ducks. After a walk up the mountain, looking at the view with a hot chocolate to keep warm and prepare myself for the walk back down again! My ultimate hot chocolate break would be sipping a mug of hot chocolate after having been out in the Arctic looking at the northern lights. That would be amazing! 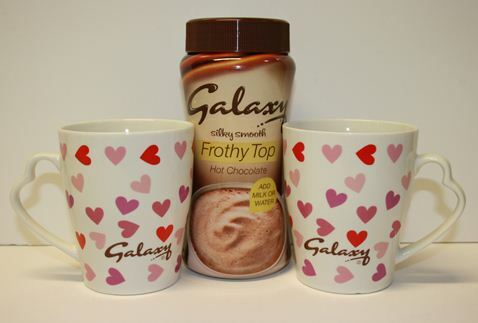 I love hot chocolate especially if it’s Galaxy to warm up the evening in our house. Sitting on a Friday night with my pjs on, feet up and a mug of hot chocolate. Thats heaven to me! I would love to be all warm & snuggy with a roaring hot fire just by myself so I can enjoy every moment. I am loving the mugs too so they would make it extra enjoyable. Would have to be in front of a roaring fire after a day out walking and enjoying the countryside…with my fella and not a kid in sight….Love them to bits but would be nice to have a break just the two of us!! My perfect hot chocolate break would be after a good long winter walk when I’m relaxing with a book or watching a soppy old movie on the tv. A steamy hot bubblebath with scented oils,candles,music,and a smooth drink.It does wonders for my spirits! Nothing like coming in from the snow after a hard day, to get a hot chocolate and just indulge and relax.